This Copenhagen accommodation is located in the center of the city within just a short distance of all of the most popular attractions. Tivoli Gardens is also located within walking distance of the Norlandia Star Copenhagen. The pedestrianized shopping street of Strget is also near the hotel along with several theaters. The Royal Palace is situated nearby as well. There are also many restaurants in the local vicinity of the hotel. The central railway station is located only 100 meters from the Norlandia Star Hotel. Secure parking is offered in the nearby area for a surcharge, as well. Guestrooms at the Norlandia Star København feature pay movies, direct dial telephones, high speed Internet service for a surcharge and satellite TV. There are 134 guestrooms at the hotel. All rooms also feature air conditioning, central heating, telephones, private bath, hair dryers and alarm clock. Non-smoking rooms are available. The hotel property offers a variety of amenities, including a breakfast room, meeting spaces, lounge bar, dry cleaning services and laundry facilities. 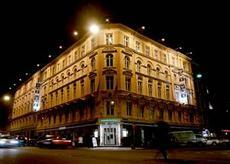 The Norlandia Star Hotel Copenhagen also provides a multilingual staff and safe deposit boxes.